Here, we describe a programmable laboratory device that can be used to create extracts of conventional cigarette smoke and electronic cigarette aerosol. This method provides a useful tool for making direct comparisons between conventional cigarettes and electronic cigarettes, and is an accessible entry point into electronic cigarette research. Anderson, C. A., Bokota, R. E., Majeste, A. E., Murfee, W. L., Wang, S. A Microcontroller Operated Device for the Generation of Liquid Extracts from Conventional Cigarette Smoke and Electronic Cigarette Aerosol. J. Vis. Exp. (131), e56709, doi:10.3791/56709 (2018). Electronic cigarettes are the most popular tobacco product among middle and high schoolers and are the most popular alternative tobacco product among adults. High quality, reproducible research on the consequences of electronic cigarette use is essential for understanding emerging public health concerns and crafting evidence based regulatory policy. While a growing number of papers discuss electronic cigarettes, there is little consistency in methods across groups and very little consensus on results. Here, we describe a programmable laboratory device that can be used to create extracts of conventional cigarette smoke and electronic cigarette aerosol. This protocol details instructions for the assembly and operation of said device, and demonstrates the use of the generated extract in two sample applications: an in vitro cell viability assay and gas-chromatography mass-spectrometry. This method provides a tool for making direct comparisons between conventional cigarettes and electronic cigarettes, and is an accessible entry point into electronic cigarette research. Despite a concentrated effort by health organizations, tobacco product use remains the leading cause of preventable death worldwide, with the majority of these deaths attributed to cigarette smoking1. Since entering the market in 2003, electronic cigarettes have been growing in popularity among tobacco product users. Currently, electronic cigarettes are the most popular alternative to conventional cigarettes among American adults (~5%)2 and the most popular nicotine delivery system among middle (~5.3%) and high schoolers (~16%)3. If current trends continue, electronic cigarettes can be expected to replace conventional cigarettes for future generations. However, the health consequences of electronic cigarette use remain unclear. Research on electronic cigarettes did not start in earnest until electronic cigarette popularity rapidly increased in 20133,4. Since that time, a number of different models have been employed to address the question of their toxicity. However, the results of many studies are conflicting, and while it seems that electronic cigarettes are generally less toxic than conventional cigarettes there is no current consensus on the health consequences of electronic cigarette use5,6,7. Our previous research indicates that electronic cigarettes are significantly less toxic to the vascular endothelium than conventional cigarettes, despite their ability to cause DNA damage and the induction of oxidative stress and cell death8. However, more research is necessary before we can draw firm conclusions about the health consequences of electronic cigarette use. As conventional cigarettes are a leading cause of preventable vascular disease9, there is a growing interest in the vascular health risk of electronic cigarette use10,11,12. In order to study the effects of electronic cigarettes on the vascular system, our lab developed a microcontroller operated smoking/vaping device (Figure 1)8. This device is capable of generating liquid extracts of either conventional cigarette smoke or electronic cigarette aerosol in either aqueous or organic solvents. As airflow is controlled by the combination of an adjustable air flow regulator and a PBASIC timing program, the device can be used to generate extracts according to any number of user defined protocols. Here we detail the assembly and operation of this device as well as two potential applications: in vitro cell viability assessment and gas-chromatography mass-spectrometry. Figure 1: Smoking/Vaping Device. Schematic for the physical assembly of the smoking/vaping device in both the cigarette/cigarette like electronic cigarette (e-cig) configuration (A) and the tank electronic cigarette configuration (B). Component Key: 1) Inhalation port; 2) primary collection impinger; 3) overflow impinger; 4) Buchner flask vacuum trap; 5) normally open solenoid valve; 6) BS1 microcontroller; 7) air flow regulator; 8) 510 threaded electronic cigarette tank base. Please click here to view a larger version of this figure. Secure a 100 mL Buchner flask (Figure 1, #4) to a steel ring stand and create a vacuum trap by filling it with 50 g of calcium chloride to serve as a desiccant. Seal the flask with a rubber through-hole stopper, wrap the stopper junction with paraffin film, and run a pipette through the hole. Using vinyl tubing, connect the pipette extending from the stopper to a t-intersection hose connector. Using vinyl tubing, connect the two impinger (Figure 1, #2 & #3) to each other and connect the output of the second impinger to the t-intersection hose connector. Using vinyl tubing, connect the input port of the first impinger to serve as an inhalation port (Figure 1, #1). Using vinyl tubing, connect the side arm of the Buchner flask to the input port of an airflow regulator (Figure 1, #7) and the exit port of the airflow regulator to a vacuum pump. Assemble the circuit according to the schematic in Figure 2A. Upload the PBASIC program SVL.bs1 (Figure 2B, also available at https://github.com/ChastainAnderson/SVL) to the BS1 microcontroller (Figure 1, #6) by means of a serial adaptor and the manufacturer's software. Place the 510 threaded base (Figure 1 #8) in a ring stand clamp. Using vinyl tubing, connect the solenoid valve (Figure 1, #5) to the free end of the t-intersection hose connector. NOTE: The device should be complete and ready for operation, check all joints to make sure that they are air tight and apply hose clamps and vacuum grease as needed. Figure 2: Electrical Schematic and PBASIC Code. Figure 2A displays the electrical schematic for assembling the electrical circuit necessary to activate both the normally open solenoid valve and the heating coil of button activated electronic cigarettes (through the 510 threaded electronic cigarette tank base). The electrical parameters of the heating coil (P: Power; R: Resistance; and I: Current) are projected and should be empirically verified with a multimeter post assembly. Figure 2B displays the PBASIC timing program needed to control the circuit in Figure 2A (also available at https://github.com/ChastainAnderson/SVL). The timing constants SVT & IPT (#5 & #6) are in units of ms and are set to provide an activation time of 2 seconds and a downtime of 28 s. Please click here to view a larger version of this figure. Store all unopened conventional and electronic cigarette samples in the dark in airtight plastic bags at room temperature. Once opened, store samples in airtight plastic bags at 4 ºC, with a paper towel to absorb excess moisture. Pre-equilibrate all samples in a room temperature humidor at ~60% humidity for at least 30 minutes prior to use. Determine the mass of each e-cigarette cartomizer/tank pre-vaping using an analytical balance. The difference in pre/post-post vaping weight will be used to determine appropriate dosing. NOTE: 3R4F reference cigarettes are assumed to contain 0.7 mg of nicotine, and the nicotine content of commercial cigarette brands can be determined by conventional analytical methods13. For sample application 1, fill the reservoir of the primary impinger with 4.3 mL of endothelial cell culture medium. For sample application 2, fill the reservoir with 5 mL of acetone. If using a conventional cigarette, apply a piece of clear tape around the filter and put an easily visible mark where the cigarette paper joins the filter. If using a cigarette like e-cigarette, make sure the battery is well charged and the cartomizer tightly screwed to the battery. If using an electronic cigarette tank, make sure that an appropriate volume of electronic cigarette liquid is loaded in the tank and screw the tank onto the 510 threaded base. Insert the tip of the conventional or electronic cigarette into the inhalation port (Figure 1, #1) and secure with a hose clamp. Turn on the vacuum pump. Adjust the flow meter to pull 1.65 L/minute to ensure a 55 mL puff over 2 seconds. Turn on the microcontroller. If using a conventional cigarette, light the cigarette on the first puff. Run until projected desired concentration (in parts per million or % weight/volume) is achieved. Determine the mass of each e-cigarette cartomizer/tank after vaporization using an analytical balance. Compare this measurement to the measurement taken in step 3.1 to determine the total mass consumed. Calculate the concentration of the consumed mass/volume of solvent. Use the molar concentration of consumed nicotine to normalize between products. If an insufficient mass was consumed, return the electronic cigarette to the device and consume further. If a sufficient or excess mass was consumed, proceed. If extract is to be used for cell culture, filter through a 0.22 µm PES syringe filter. Use the extracts immediately or store at -80 ºC. As part of the preparation for Anderson, et al.8, electronic cigarette aerosol was demonstrated to be stable for at least two weeks, and the stability of cigarette smoke for up to two years has been established by Crooks, et al.13. After each extraction, rinse the tubing and reservoirs of the device with 70% ethanol and deionized water to prevent carry over between samples. Following rinsing, briefly run the empty device to allow airflow to assist the drying of the lines. Perform extract as above into 4.3 mL of endothelial cell growth medium. One day prior, seed human umbilical vein endothelial cells into 96 well plates at a density of 1 x 104 cells/wellin 100 µL of endothelial cell growth medium. Treat the cells by replacing the old endothelial cell culture medium with either 100 µL of fresh endothelial cell culture medium to serve as a control or 75 µL of endothelial cell growth medium mixed with 25 µL of a 2 mM consumed nicotine concentration extract (1.4 mg consumed nicotine into 4.3 mL endothelial cell growth medium) for a final concentration of 500 µM to serve as treatment. As many of the components of both cigarette smoke and electronic cigarette aerosol are volatile, use a foil seal to keep the wells airtight. Incubate the plate 18–24 h at 37 °C and 5% CO2. Create a 100x neutral red stock solution by dissolving 33 mg of neutral red dye into 10 mL of buffered salt solution. Shortly before use, dilute 100x stock solution 1:100 in cell culture medium to create 1x neutral red staining solution. Incubate neutral red staining solution at 37 °C for at least 30 min prior to use and use immediately. NOTE: It is normal for some crystals to precipitate during incubation. Care should be taken to avoid applying these crystals to the cell culture wells. If needed, a .22 µm filter can be used to filter the neutral red stock and staining solutions. Remove extract and add 100 µL of neutral red staining solution per well, use excess to create at least three blank wells for proper quantification. Incubate the plate at 2–4 h at 37 °C and 5% CO2. Remove neutral red staining solution and wash 3x by submersion in PBS. Apply neutral red de-stain solution (50% deionized water, 49% ethanol, 1% acetic acid). Incubate at least 10 min at room temperature with shaking. Read absorbance at 540 nm. Analyze data by subtracting out the average value of the blank wells and normalizing to the average of the blank adjusted control well value. Perform extraction as above into 5 mL of acetone. Run the device to achieve a final concentration of ~100 parts per million (weight of e-liquid consumed/volume of acetone) of your sample. Using a precision glass syringe, inject 1 µL into the injector of a GC-MS device. Inject at 250 °C with a 1:20 split ratio into a coupled gas chromatograph/quadrupole spectrometer system equipped with a ZB-5 column with the following oven protocol: 1 min at 50 °C; ramp 10 °C/min to 140 °C; ramp 20 °C/min to 300 °C and hold for 10 min. Match resulting mass spectra to target library to identify aerosol components. 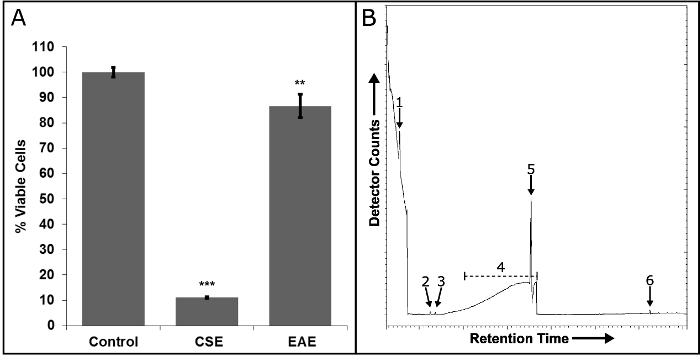 Within 24 hours of the exposure of human umbilical vein endothelial cells to either conventional cigarette smoke extract (CSE) or electronic cigarette aerosol extract (EAE), there is a significant (control vs. CSE P <0.001; control vs. EAE P <0.01; n = 6) reduction in cell viability (Figure 3A). Extracts were generated with a puffing profile of 2, 2 second, 55 mL puffs per minute and normalized based on molar concentration of nicotine consumed by the device. Exposure to 500 µM consumed nicotine equivalents of CSE dramatically reduces viable cells to 11.06 ± 0.28% of control, and exposure to 500 µM consumed nicotine equivalents of EAE reduces viable cells to 86.65 ± 4.60% of control. 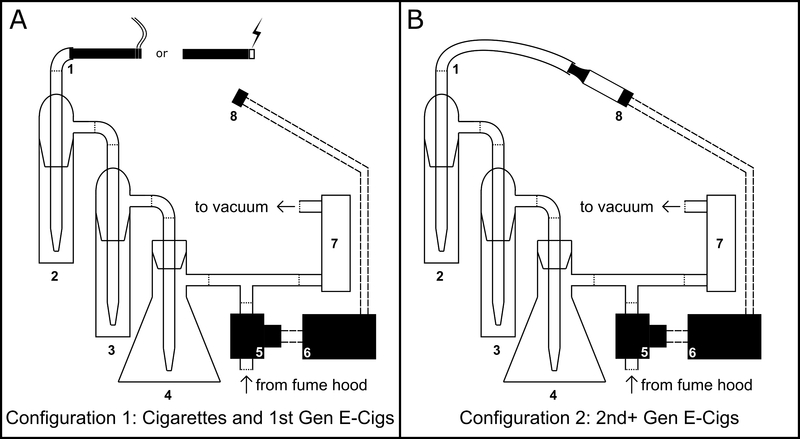 Figure 3B demonstrates the volatility based separation of electronic cigarette components from a commercial electronic cigarette by gas chromatography. The components were then identified via quadrupole mass spectrometry. Identified components, in order of volatility, include: propylene glycol, acetyl propionyl, chlorobutanol, glycerol, nicotine, and 3-nitropthalic acid. Of these only propylene glycol, glycerol, and nicotine were disclosed on the product label1. Figure 3: Sample Applications: Cell Viability and GC-MS. Figure 3A displays the results of a neutral red uptake assay performed on human umbilical vein endothelial cells exposed to 500 µM consumed nicotine equivalents of either conventional cigarette smoke from a 3R4F research reference cigarette (CSE) or electronic cigarette aerosol from a commercially available electronic cigarette (EAE). Bars are mean +/- standard deviation. Significance determined by two tailed, unpaired, t-test and results indicated by asterisks: ** P <0.01; *** P <0.001; n = 6. Figure 3B displays the results of a gas chromatograph of electronic cigarette aerosol solubilized in acetone. Peaks represent individual compounds ordered by retention time (volatility) and were identified by quadrupole mass spectrometry. 1) propylene glycol; 2) acetyl propionyl; 3) chlorobutanol; 4) glycerol; 5) nicotine; 6) 3-nitropthalic acid. Please click here to view a larger version of this figure. The most critical elements of this protocol are ensuring the device is clean at the start and finish of each extraction, and ensuring that all seals are maintained so that air flow remains consistent. If the device is not properly cleaned, there is a risk of carry over between samples. Additionally, if the device is left unclean for an extended period of time condensed aerosol and dried solvent can block the system. Note that it is normal for there to be a pressure drop when puffing a conventional cigarette and the airflow meter should be adjusted to provide the desired airflow during the puff, not while the device is pulling room air. A key feature of this method is the ability to be adapted to keep up with the advancement of electronic cigarette technology. For instance, many electronic cigarettes require button press activation of the heating coil. This device directly incorporates the heating coil into the control circuit (Figure 2A) mimicking a button press at user programmed intervals. The primary limitations of this method arise from the lack of well characterized standard operating procedures for electronic cigarette use. While we can use a research reference cigarette14 and international protocols15,16 for conventional cigarettes, we are merely adapting these methods to electronic cigarettes and cannot guarantee that it appropriately models electronic cigarette user behavior. Additionally, this protocol produces extract in a liquid medium. While this is appropriate for certain cell types, such as endothelial cells, other cell types, such as airway cells, may be better studied through direct exposure to electronic cigarette aerosol. where P: Power; V: Voltage; R: Resistance; and I: Current. As there is no broadly accepted international standard operating procedure for electronic cigarette use, and different groups may wish to employ different parameters and puffing profiles. A common electronic cigarette standard is CORESTA CRM8118, though some groups continue to use modified versions of conventional cigarette smoking protocols such as ISO 3088:201215 and WHO TobLabNet SOP 116. Additionally, many laboratories continue to use laboratory and/or institution specific regimes. In this instance, we employed a square wave puff profile consisting of 2, 2 second, 55 mL puffs per minute; however, the modular, programmable nature of the device allows it to be adapted to other puffing profiles as needed. Puff volume can be changed directly by adjusting the air flow meter. Puff time and heating coil activation time can be altered by changing the SVT and IPT constants in the program SVL.bs1 (Figure 2B, #5 & #6). If one were to want to de-synchronize the puffing time and the activation time, this could be done by splitting the SVT and IPT constants, e.g. SVT1 representing the time between the activation of the heating circuit and the valve circuit, SVT2 representing the time between the activation of the valve circuit and the inactivation of the heating circuit, and SVT3 representing the time between the inactivation of the heating circuit and the inactivation of the valve circuit, and likewise for IPT. While the 510 threaded base is common in many tank electronic cigarettes, it is not universal. A differently threaded base can be substituted if the user requires. If a square wave profile is not desired, replace either the air flow meter or solenoid valve with a continuous programable component to reshape the wave profile. As electronic cigarette research progresses, the availability and accessibility of electronic cigarette smoking devices remains a hurdle. Cigarette smoking machines have been an integral part of tobacco product research as early as 1843 and today there are a variety of commercially available smoking machines for conventional cigarettes19,20. There are multiple established standard operating procedures for conventional cigarette smoking21. However, many conventional cigarette smoking devices proved incapable of accurately smoking electronic cigarettes due to the design differences between conventional and electronic cigarettes and differences within electronic cigarette brands and models, such as: diameter, PSI requirements, and the need for sensor or button based activation17. Currently there is a heterogenous commercial field of electronic cigarette smoking machines that includes devices including devices designed for direct aerosol extraction as well as air liquid interface exposure (such as Borgwalt22 and Vitrocell22,23). Despite the availability of commercial options, many groups, continue to use devices fabricated within their own laboratory for aerosol extraction 10,11,12,24,25,26. The motivations for this are varied. In some cases, researchers seek to better model human behavior10. Others are attempting to maintain continuity with previously published studies of cigarette smoke12. Still others directly cite the inaccessibility of commercial alternatives as a motivation for in laboratory fabrication24. These devices take many forms and, in many cases, use laboratory specific protocols. Unfortunately, the mechanisms, efficacy, and capabilities of these devices and protocols are often under-reported. The first of the two sample applications presented above (Figure 3A) demonstrates the effects of conventional cigarette smoke and electronic cigarette aerosol on endothelial cell viability. As conventional cigarette smoke has been demonstrated to cause endothelial cell death and dysfunction9, it's reasonable to hypothesize that electronic cigarette aerosol would have a similar effect. To test this, we exposed human umbilical vein endothelial cells to nicotine equivalent levels of either conventional cigarette smoke extract or electronic cigarette aerosol extract for 24 h. While both conventional cigarette smoke and electronic cigarette aerosol cause statistically significant reductions in cell viability, the effect size of the electronic cigarette aerosol induced reduction is ~13% while the reduction after conventional cigarette smoke exposure nears 90%. While this supports the idea that electronic cigarettes are less harmful to the vascular system than conventional cigarettes, they are still not safe. The second of the two sample applications presented above (Figure 3B) demonstrates that electronic cigarette aerosol extracted into organic solvent can be separated into its components and analyzed via mass spectrometry. The component list generated provides information about the accuracy of labeling in electronic cigarette products, and highlights certain potentially harmful components such as acetyl propionyl (2,3-pentanedione)27. While the components identified in this experiment were not quantified, quantification can be performed by conventional analytical techniques such as those presented in CORESTA CRM8428. Here, we have presented a programmable laboratory device capable of generating liquid extract from the conventional cigarette smoke or electronic cigarette aerosol. This device can accommodate a diverse array of product designs (such as the leading commercial brands of electronic cigarette) and the extraction process can be customized to user specifications. In this specific instance, we have demonstrated the use of generated extract in an endothelial cell viability assay; however, the extracts generated by this device could be applied to any type of single cell population as well as co-culture, explant, or other in vitro model. These extracts are compatible with a wide number of frequently used biological assays including reactive oxygen species detection, cell proliferation assays, and conventional immuno-staining. Moreover, the ability to break down the composition of electronic cigarette extract via gas-chromatography mass-spectrometry provides a starting point for detailed studies of individual aerosol components. Overall, this device provides an accessible entry point to electronic cigarette research. The Tobacco Product Regulatory Science Research Fellowship program administered by Tulane University is funded by Altria Client Services Regulatory Affairs. The authors acknowledge the assistance of Dr. Robert Dotson of the Tulane University Department of Cell and Molecular Biology for his assistance in editing the manuscript and Dr. James Bollinger of the Tulane University Department of Chemistry for his assistance with mass spectrometry protocol design. The authors further acknowledge the Tulane University Department of Cell and Molecular Biology and the Tulane University Department of Chemistry for their support and the use of space and equipment. This work was supported by a Tobacco Product Regulatory Science Research Fellowship to C. Anderson from the Tulane University School of Science and Engineering. World Health Organization. WHO Report on the Global Tobacco Epidemic, 2011. Italy. (2011). Weaver, S. R., Majeed, B. A., Pechacek, T. F., Nyman, A. L., Gregory, K. R., Eriksen, M. P. Use of electronic nicotine delivery systems and other tobacco products among USA adults, 2014: results from a national survey. Int. J. Public Health. 61, (2), 177-188 (2016). Singh, T., et al. Tobacco Use Among Middle and High School Students - United States, 2011–2015. MMWR Morb. Mortal. Wkly. Rep. 65, (14), 361-367 (2016). Corey, C. G., Ambrose, B. K., Apelberg, B. J., King, B. A. Flavored Tobacco Product Use Among Middle and High School Students--United States, 2014. MMWR Morb. Mortal. Wkly. Rep. 64, (38), 1066-1070 (2015). Pisinger, C., Døssing, M. A systematic review of health effects of electronic cigarettes. Prev. Med. 69, 248-260 (2014). Callahan-Lyon, P. Electronic cigarettes: human health effects. Tob. Control. 23, (Suppl 2), ii36-ii40 (2014). Dinakar, C., O'Connor, G. T. The Health Effects of Electronic Cigarettes. N. Engl. J. Med. 375, (14), 1372-1381 (2016). Anderson, C., Majeste, A., Hanus, J., Wang, S. E-cigarette aerosol exposure induces reactive oxygen species, DNA damage, and cell death in vascular endothelial cells. Toxicol. Sci. Off. J. Soc. Toxicol. (2016). U.S. Department of Health and Human Services. The Health Consequences of Smoking: 50 Years of Progress. A Report of the Surgeon General. Atlanta, GA. U.S. Department of Health and Human Services, Centers for Disease Control and Prevention, National Center for Chronic Disease Prevention and Health Promotion, Office on Smoking and Health (2014). Farsalinos, K., et al. Comparison of the Cytotoxic Potential of Cigarette Smoke and Electronic Cigarette Vapour Extract on Cultured Myocardial Cells. Int. J. Environ. Res. Public. Health. 10, (10), 5146-5162 (2013). Schweitzer, K. S., et al. Endothelial disruptive proinflammatory effects of nicotine and e-cigarette vapor exposures. Am. J. Physiol. - Lung Cell. Mol. Physiol. 309, (2), L175-L187 (2015). Putzhammer, R., et al. Vapours of US and EU Market Leader Electronic Cigarette Brands and Liquids Are Cytotoxic for Human Vascular Endothelial Cells. PLOS ONE. 11, (6), e0157337 (2016). Crooks, I., Dillon, D. M., Scott, J. K., Ballantyne, M., Meredith, C. The effect of long term storage on tobacco smoke particulate matter in in vitro genotoxicity and cytotoxicity assays. Regul. Toxicol. Pharmacol. 65, (2), 196-200 (2013). Roemer, E., et al. Mainstream Smoke Chemistry and in Vitro and In Vivo Toxicity of the Reference Cigarettes 3R4F and 2R4F. Beitr. Zur Tab. Contrib. Tob. Res. 25, (1), (2014). International Organization for Standards. ISO 3088:2012 Routine analytical cigarette smoking machine – Definitions and standard conditions. (2012). World Health Organization. Standard Operating Procedure for Intense Smoking of Cigarettes. (2012). Brown, C. J., Cheng, J. M. Electronic cigarettes: product characterisation and design considerations. Tob. Control. 23, (Suppl 2), ii4-ii10 (2014). Cooperation Centre for Scientific Research Relative to Tobacco. CRM No. 81 - Routine Analytical Machine for E-Cigarette Aerosol Generation and Collection - Definitions and Standard Conditions. (2015). Thorne, D., Adamson, J. A review of in vitro cigarette smoke exposure systems. Exp. Toxicol. Pathol. 65, (7-8), 1183-1193 (2013). Klus, H., Boenke-Nimphius, B., Müller, L. Cigarette Mainstream Smoke: The Evolution of Methods and Devices for Generation, Exposure and Collection. Beitr. Zur Tab. Contrib. Tob. Res. 27, (4), (2016). Baker, R. The Development and Significance of Standards for Smoking-Machine Methodology. Beitr. Zur Tab. Contrib. Tob. Res. 20, (1), (2014). Thorne, D., Crooks, I., Hollings, M., Seymour, A., Meredith, C., Gaca, M. The mutagenic assessment of an electronic-cigarette and reference cigarette smoke using the Ames assay in strains TA98 and TA100. Mutat. Res. Toxicol. Environ. Mutagen. 812, 29-38 (2016). Thorne, D., Larard, S., Baxter, A., Meredith, C., Gaҫa, M. The comparative in vitro assessment of e-cigarette and cigarette smoke aerosols using the γH2AX assay and applied dose measurements. Toxicol. Lett. 265, 170-178 (2017). Herrington, J. S., Myers, C. Electronic cigarette solutions and resultant aerosol profiles. J. Chromatogr. A. 1418, 192-199 (2015). Yu, V., et al. Electronic cigarettes induce DNA strand breaks and cell death independently of nicotine in cell lines. Oral Oncol. 52, 58-65 (2016). Ji, E. H., et al. Characterization of Electronic Cigarette Aerosol and Its Induction of Oxidative Stress Response in Oral Keratinocytes. PLOS ONE. 11, (5), e0154447 (2016). Morgan, D. L., et al. Chemical Reactivity and Respiratory Toxicity of the -Diketone Flavoring Agents: 2,3-Butanedione, 2,3-Pentanedione, and 2,3-Hexanedione. Toxicol. Pathol. 44, (5), 763-783 (2016). Cooperation Centre for Scientific Research Relative to Tobacco. CRM No. 84 - Determination of Glycerin, Propylene Glycol, Water, and Nicotine in the Aerosol of E-Cigarettes by Gas Chromatographic Analysis. (2017).